Our Lady, Queen of the Knights, bless all the activities of our Order. Keep us true to our pledge, to extend the kingship of thy divine son on earth. Through Thine intercession, win for us the grace, ever to exemplify in our public and private lives, the virtues that should characterize those especially dedicated to the service of the heavenly court. 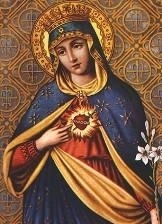 Accept, O Mary, this renewed pledge of fidelity and devotion, of Thy Servants, the Knights of Columbus. Amen. Find out why you should be a Knight! Knights Essay Contest Coming Soon Attention High School students. Stay tuned for the essay contest starting soon.